If finance chiefs could choose a new name for the compliance function, many would settle on something like this: The Department of Necessary Evils. After all, companies have traditionally viewed compliance as a costly burden, sapping valuable resources from revenue-generating activity. Lacking metrics to demonstrate the positive value of an investment in compliance, the function’s champions have usually resorted to focusing on what it would help the company avoid: fines, legal sanctions, lawsuits. 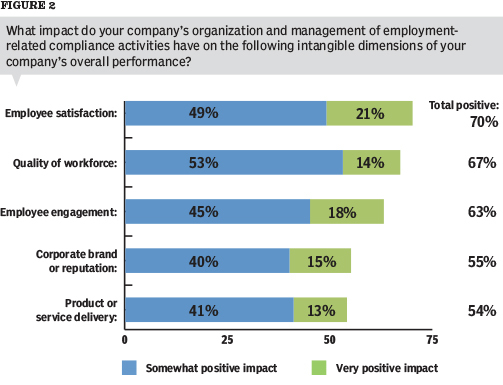 But a recent survey conducted by CFO Research, in collaboration with ADP, a provider of human capital management services, has revealed that senior executives in both finance and human resources now believe that effective compliance programs deliver tangible benefits and measurable returns, contributing to the bottom line. The survey collected responses from 152 senior finance and HR executives about the payoffs their companies receive from employment-related tax and payment compliance. Companies that operate their compliance function on an ad-hoc basis frequently find themselves scrambling to keep up with the never-ending stream of new rules and regulations. Instead of taking a short-term view of the function, finance chiefs ought to see compliance as a continuous process and a growth opportunity that can help boost business performance. “We have a committed team that knows what’s going on and is dedicated to ensuring all the right things get done,” said one survey respondent, explaining the secret of his company’s compliance-related success. By tackling compliance in a consistent and integrated manner, managers have an opportunity to create a working environment that is less isolating, more transparent, and increasingly conducive to open dialogue. That transformation, however, can only begin by “setting a strong tone at the top” about compliance, said one executive survey-taker. Getting “buy-in for change from executives,” as another respondent put it, empowers employees, enabling them to join together to take on a greater mission. In other words, paying attention pays off. 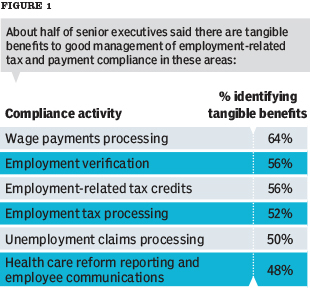 Executives who ranked compliance as a higher priority tended to give a higher grade to their company’s management of employment-related tax and payment compliance, the survey found. Two-thirds of those who said compliance was among their top priorities gave the function an “A” or “B,” while nearly half (47 percent) of those who regarded compliance as either a lower priority or not a priority slapped their compliance efforts with a “C.” (Perhaps because of grade inflation, no participants judged their company’s compliance systems as performing lower than a “C,” or average.) Clearly, executives believe their companies are reaping the benefits of taking a proactive approach to managing compliance across the enterprise. Those who are waiting for a compliance crisis to push such an initiative to the top of their to-do lists are likely to end up with a compliance function that is inefficient and expensive to maintain. “We view this area as a necessary evil,” said one survey respondent, expressing a sentiment that was echoed by others. Of course, managing compliance effectively requires an investment in dollars, not just attention. As one respondent said, “We need to improve and invest in better technology for employment-related compliance.” Beyond that investment, companies will also need to spend money on finding, hiring, and training employees who are skilled in managing compliance operations and have a part to play in improving the overall global compliance function. Compliance, as the survey revealed, constitutes an operational opportunity. 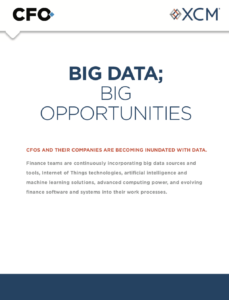 Who wouldn’t invest in a function that will help the business achieve cost efficiencies, improve employee engagement, manage risk, and meet regulatory requirements? That, as it happens, is the real bottom line — or should be — when it comes to compliance. i completely agree with findings. The compliance always boost employee morale and develops confidence and trust in management of the company. Somebody gets that there is more to Compliance Programs than following the rule of law. Intruiging article, and agree that compliance can add value. Though I also have the strong impression that just doing the things you are supposed to do and being open and honest about this has a strong pay-off. Compliance can be easily replaced by internal control to my view, reading the article. One part I seem to miss is that compliance (or internal control) is just normal ordinary day-to-day business and no rocket science. I would really like to see something on the value of compliance for organizations with program-specific funding streams. For those of us who deal with donor/funding-entity restricted revenue, compliance has a very real, very direct impact on the bottom line in a different way. For us, compliance begins as far away from the accounting department as we can get it. A lack of understanding “in the field” regarding acceptable expenditures translates to unbillable charges which, more likely than not, will have to be absorbed by general operations. And in most cases, that well is pretty shallow. Unfortunately, by the time the compliance folks see a questionable charge, it’s too late. And, as you might expect, attempts to educate and inform the people running programs or managing projects is viewed as an annoyance at best and as obstructive at worst. You are so correct about CEO’s and top Executives endorsing your presenter! world bringing to lite the Risks and Liabilities when NOT in compliance. While we cannot make the Gatekeepers, HR, CEO, CFO, Presidents or VP’s step in line the Liability and Fines are very steep! Again, how would you like it for the gatekeeper to Speak on your behalf and that person only gets fired, while Owners and Top Exec.’s get the fines, penalties and in some cases Prison! Does that sound like a problem an owner, top executives want to leave to an employee that really doesn’t understand about Compliance, especially when it comes to IDTheft in the work place? Today people only think of FACTA as an Credit or IT issue. That my friends is so far from the truth. It doesn’t matter how many Employees you have, meaning any company is subject to these compliance laws. Today it does not have to cost the company anything! 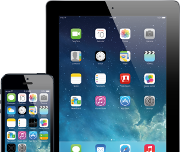 Currently what I do is offer this Compliance product as an Voluntary Employee Group Benefit. The doctrine says employees are to be offered an Mitigation Plan, they don’t have to take it, but MUST BE OFFERED! Today it does not have to cost the company anything! Currently what I do is offer this Compliance product as an Voluntary Employee Group Benefit. The doctrine says employees are to be offered an Mitigation Plan, they don’t have to take it, but MUST BE OFFERED and go through Training!! Employers, Legal Dept., Hr are NOT aware.